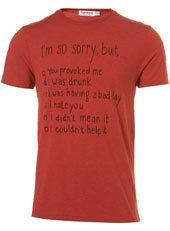 Is this T-shirt a deliberate trivialisation of domestic violence? I’m struggling to decide whether the Topman T-shirt that’s been causing a stir today is a deliberate allusion to, and therefore trivialisation of, domestic violence; or whether it was intended to be worn as a kind of self-parody. Men, after all, are stereotyped for their ability to apologise for a whole host of offences, many of them minor, with the catch-all “I’m sorry, I didn’t mean it”. I imagine Topman’s defence will be just that – that by wearing the T-shirt, men will be effectively taking the piss out of themselves for being such dysfunctional individuals. In other words, it’s humorous banter. But the reference to “you provoked me” does suggest violence in particular is the implied offence. No-one says “you provoked me” to justify not doing the washing up, or leaving the loo seat up again. And let’s be fair, a lot of Topman customers probably lack the intellect or level of self-awareness to wear slogans on their clothing for the purposes of self-parody. I’ve always disliked clothing that carries slogans and logos. It seems such an unimaginative way of declaring one’s allegiances; it’s saying “I don’t have any ideas or personality of my own so I’ll wear someone else’s ideas to try and create an identity for myself”. If the intention of Topman designers really was to send young men out in public trivialising domestic violence, this T-shirt is tasteless at best. And even more so when worn by the type of intellectually vacant thug that one imagines will be the customer most likely to be attracted by it. There’s some interesting debate on Twitter at the moment (#topman), with many outraged by this T-shirt and others arguing it’s a bit of fun and there are plenty of more offensive slogans and items of clothing available. Any opinions? Here’s the link to the product on the company’s website. I wonder if it will still be there by the end of the day. just don’t try coming over this side of the Pond wearing one! At least men apologise. Getting a “sorry” from my wife is like pulling teeth. Which is what I usually have to threaten to do…. ah, but when a woman apologises you know she means it!